Samsung should send a thank-you note to Apple for holding back the iPhone 5 release until September. 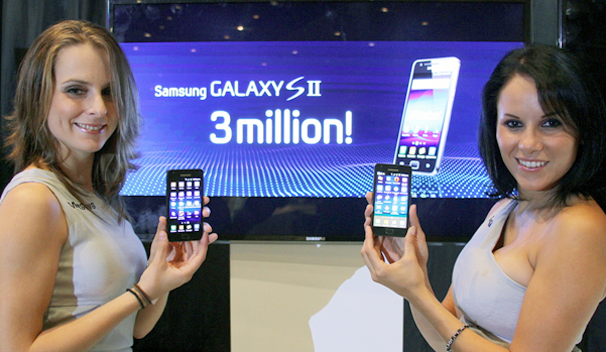 Samsung managed to sell a record 3 million Galaxy S II Android smartphones in just 55 days. Eat your heart out, Apple. Most of the Galaxy S II sales, Samsung says, were in Europe and Asia as well as Latin America. According to the company, Samsung Electronics topped the Austrian smartphone market with the market share of 30 percent. It also seized 36 percent of the smartphone market in Switzerland. One important thing Samsung forgot to mention is when the Galaxy S II smartphone will arrive on U.S. shores. With no official word from Samsung on the U.S. release, speculation is plentiful. If Samsung is indeed aiming for a late July release of the Galaxy S II on all major U.S. carriers, the company will be able to continue to enjoy two more months before Apple are expected to release the iPhone 5, which would curb the sales for Samsung's lookalike, albeit more powerful (than the iPhone 4) Android smartphone.